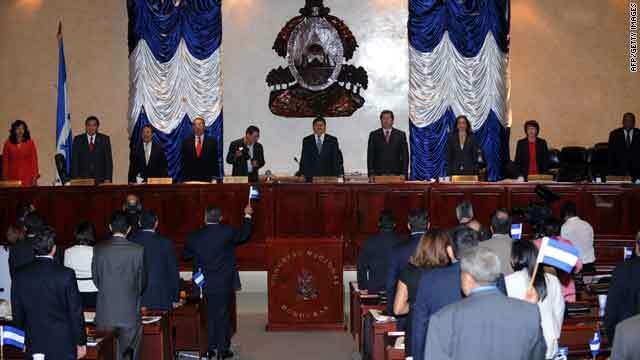 Members of the Honduran congress sing the national anthem after rejecting the reinstatement of ousted President Jose Manuel Zelaya on Wednesday. (CNN) -- Deposed Honduran President Jose Manuel Zelaya will not be reinstated as head of state, an overwhelming majority of the Honduran congress voted Wednesday. In an hours-long process, 111 lawmakers voted in favor of a motion not to return Zelaya to office. A majority of 65 votes in the 128-member body was required to reject his reinstatement. Zelaya was removed from office in a military-led coup on June 28 and replaced by congressional leader Roberto Micheletti. On Wednesday, lawmakers voted one by one and addressed the chamber as they cast their vote, making for a slow process. The vote was a key part of a U.S.-brokered pact that representatives for Zelaya and Micheletti signed October 29, giving Congress the power to decide Zelaya's fate. The United States expressed disappointment Thursday over the latest rebuff to its diplomatic efforts to end the political crisis in Honduras. U.S. Assistant Secretary of State for Western Hemisphere Affairs Arturo Valenzuela continued to call on the Honduran government to allow Zelaya's return and to create a unity government in the interim period before the new president takes office next month. "We are disappointed by this decision since the United States had hoped the [Honduran] Congress would have approved his return," Valenzuela said in a conference call with journalists in Washington. "Our policy since June 28 has been consistently principled. It has condemned the coup d'etat and continued to accept President Zelaya as the democratically elected and legitimate leader of Honduras throughout this political crisis." The United States continues to call for Honduras to engage in national reconciliation and creation of a truth commission to investigate the crisis, in addition to the unity government. "The absence of democratic, constitutional order is the unacceptable status quo," a senior U.S. administration official said on the conference call, remaining anonymous under the ground rules of the call and because of the sensitivity of the situation. "The election is a step toward a day where Honduras will have an electorally legitimate government in place." Zelaya, who says he does not recognize the election, also has said he would not accept the post even if Congress voted him back in. Accepting the job, he said, would legitimize the coup. Many nations said before the Sunday's election they would withhold recognition if Zelaya were not returned to power. Some countries, such as the United States, Colombia and Costa Rica, have said they will recognize Lobo. Others, such as Argentina, Brazil and Spain, have said they will not. Despite the diplomatic pressure from abroad, lawmakers were voting the will of the people, Congressman Juan Angel Rivera Tabora said. "History will judge us, and I'm certain it will judge us positively," he said. "Congress didn't make this problem. The problem came to us." Those voting against Zelaya echoed those sentiments. After the coup, the same body voted to install Micheletti as interim president. Wednesday vote only happened because the agreement between the two sides called for it, many lawmakers repeated. Congress sought opinions from the nation's Supreme Court and other bodies before holding the vote. The court ruled last week that Zelaya cannot return to office without facing trial on charges that he acted unconstitutionally when he tried to hold a vote that could have led to the removal of presidential term limits. The Supreme Court ruled before the coup that the vote was illegal and Congress had forbidden it. But the United Nations, the Organization of American States, the European Union and most nations -- including the United States -- condemned the coup and demanded that Zelaya be reinstated immediately. He wasn't. Zelaya, who was flown out of the country while still in his pajamas on the day of the coup, has been staying at the Brazilian Embassy in Honduras' capital since secretly returning to the country September 21.